When we became pretty convinced that the “trailer trawler” alternative was what we wanted to explore, I began thinking very seriously about existing boats, and we even looked at a couple. C Dory — Tough little boat, but too spartan..
C Dory Tomcat — I would be scared to death to go that fast. Cutlass — Too racy, trying to cram too much stuff into a small package. Rosborough — Great Canadian boat now manufactured by a very reputable U.S. company, Eastern Boats. When we were on the Loop, we saw them everywhere. I would have been perfectly happy with a Rossie, if I were a single-hander. But they are a pretty small package for those times when Molly would be aboard, and again, a little spartan — lot’s of visible fiberglass, the sleeping area would be tough on my claustrophobic wife. 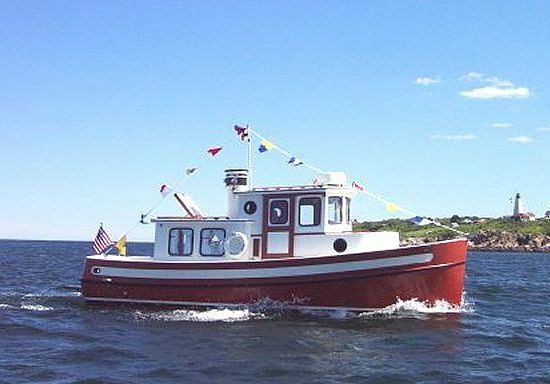 Nordic Tug 26 — We were really scouring the listings on this one, because we thought it was THE one. 26 feet, diesel power, wonderful reputation, seemed to be a lot of boats available with great equipment at a decent price. But at the very edge of the “trailerable” spectrum. You’d have to hire a company with permits for over 8.5 feet and some pretty serious towing equipment because these babies run 8,000 pounds and up. And while Nordic Tug has made a couple recently, the $200,000+ price tag is ridiculous. So any reasonably-priced boat would be 20+ years old. I saw a lot of time and expense in fixing up ahead. My big worry with the Nordic Tug was that we’d never really take it out of the Northeast because of the difficulty moving it, or it would sit in Florida all summer with us at home in Connecticut — and that would mean another boat, because I have to have a boat nearby or I go into withdrawal and depression. Ranger Tugs — Okay, if Jim and Lisa Favors are the Rock Stars of my world, why not just go ahead and be a super-groupie and copy their boat, too? I know a guy in Chicago who wears an Elvis suit on the least pretext, and he is pretty comfortable with his idol worship. We always thought the Rangers were attractive and well thought out. But they do seem to cram a lot of complex equipment into a small package. And (forgive me, dear friends) that tugboat look might be just a tad too cute. But I’d have written a check for a Ranger the day after the check for Memsahib cleared, but for one factor: my new, huge, Madison Kit Builders shop, my serial boat-building and my whining and kvetching about all the boats we were considering. I knew that down deep, I really wanted wood, and I really wanted to build a BIG one, just to see if I could do it. One of the reasons I was looking at a glass boat was that I study and review every boat design that comes out, and am acquainted with most of the handful of guys who design for home builders. I just didn’t know any designs off the top of my head that would work. Doug Hylan — His Marsh Hen is dog gone close to what I need in basic principles, but would need a lot of redesign to turn it into an all-weather cruiser. And just a shade big. Karl Stambaugh — His 26-footer seemed a little too basic and slow, his 28 that looks like a Nordic Tug, a bit too complex. Sam Devlin, the absolutely obvious choice — His aesthetic is wonderful and right in tune with the conservative Pacific Coast look I admire. His record is unbeaten in producing fast, successful designs, and he is just one hell of a good guy. I took his class at Wooden Boat School and have run into him at boat shows for years. But again, his Dunlin 22 and Surf Scoter are a bit too small, the Top Knot, etc. a bit too big. 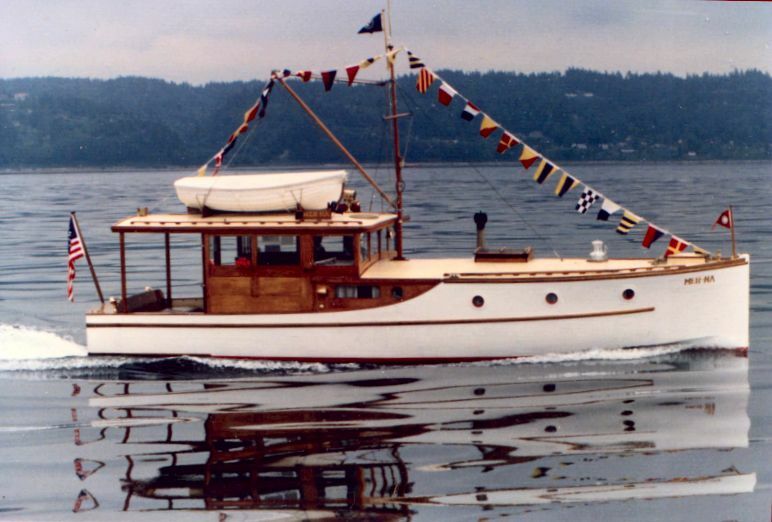 So I was literally a day or two away from asking Sam to turn the 22-foot Dunlin (perfect in looks and concept) into the 26-foot Kessinger Special. But then I found a blog by a couple in Montana doing an extraordinary job building a 29-foot cutter designed by someone who I’d sort of heard of called Mark Smaalders. So I went to his site and bells rang, sirens wailed, I felt faint and had a Mount Gay. 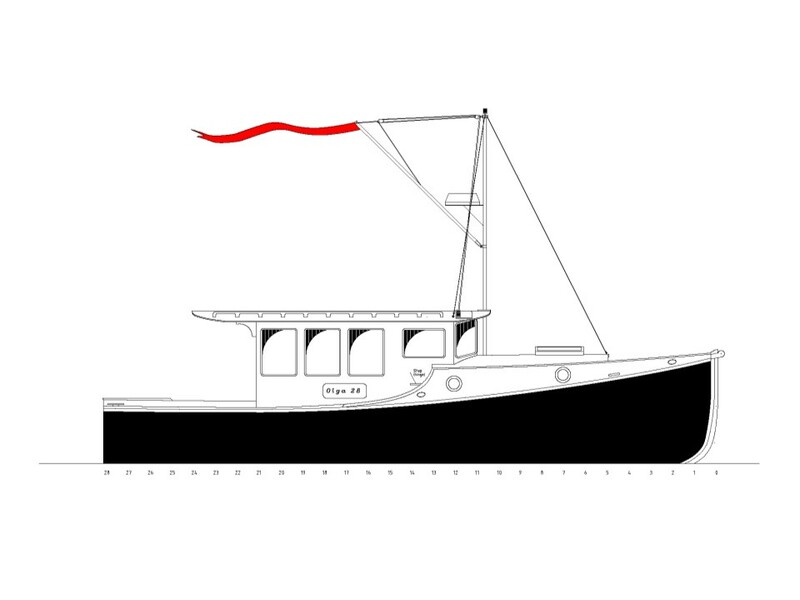 There she was, a new design, the Olga 28. Everything I wanted — 28 feet; light and trailerable; not too much power, but fast enough; big deckhouse and raised deck for room. WOOD (and probably 500 pounds of glass and epoxy, but who’s counting). Most of all, the look: a mini Lake Union Dream Boat, my absolute favorite classic powerboat design. And all of it sitting on a William Hand/Billy Atkin, V-bottom hull. I don’t want to take you that deep, because that’s only a big deal to about 23 people in the entire world, but important to me. Plans were purchased, Memsahib sold, and away we go. Sorry, Sam, maybe next time. Tardis is coming along beautifully. Way above the wood butcher level! Your blog is great and we are so proud to have helped you find Mark Smaalders, a true gem. Keep up the good work, and make a visit to the Pacific Northwest soon. the more I read, the more echoes I hear, again…….